The all-new Maruti Swift 2018 details are out now. It has grown in dimensions, interior space, fuel efficiency and is now more fun to drive car. It’s official now! The most awaited third generation model of Maruti Suzuki Swift will be launched at the Auto Expo 2018, which kicks off on February 7, 2018 at Greater Noida. Country’s largest passenger car maker has officially revealed all the details related to the popular Indian hatchback. 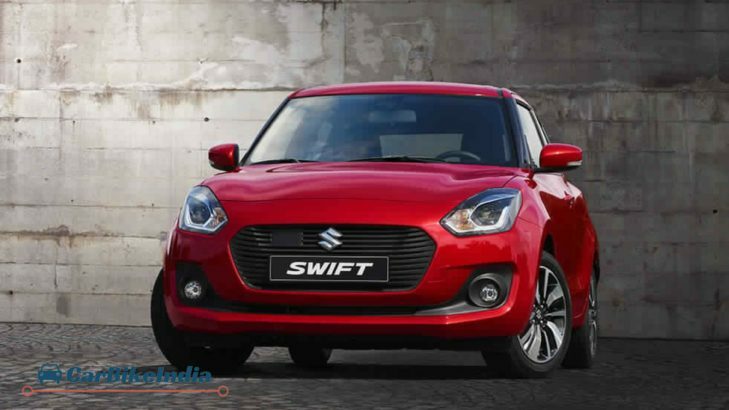 Nationwide dealers of Maruti Suzuki have starting accepting the pre-launch bookings of the Swift 2018 with an initial sum of Rs 11,000. For the first time, the New Swift will be presented with the automated manual transmission (AMT). The Swift 2018 price is expected fall in the price bracket of Rs 4.80 Lakh – Rs 7.47 Lakh (ex-showroom, New Delhi). The New Swift will lock horns with the likes of Hyundai Grand i10, Honda Jazz VW Polo, Ford Figo, Toyota Etios Liva, Nissan Micra etc. New Swift is based on the well-appreciated Heartect platform, which currently performs its duties on the New Maruti Dzire, Maruti Baleno and Maruti Ignis. Both the conventional fuel choice models are packed with the tried and tested duo of 1.2L K12 petrol and 1.3L DDiS diesel engines. The mechanical output remains the same with 1.2L petrol engine giving out 83PS at 6000 rpm and 113Nm at 4200 rpm, whilst the diesel counterpart with its 1.3L mill produces 75PS at 4000rpm and 190Nm at 2000rpm of power and torque respectively. The New Swift will be presented in as many as 12 variants to choose from. Each engine choice shares a total of six variants. The LXi/LDi, VXi/VDi, ZXi/ZDi and ZXi+/ZDi+ will feature a 5-speed manual transmission, while the AMT choice will be offered only on the VXi/VDi and ZXi/ZDi variants. Maruti Suzuki Swift will be offered in six vibrant shades of Midnight Blue, Solid Fire Red, Silky Silver, Magma Grey, Pearl Arctic White and a newly introduced color in the form of Prime Lucent Orange. With the Heartect platform underneath, the new Swift now grows 40mm wider, shares a 20mm longer wheelbase alongside possesses an added 24mm of headroom. The light-weight platform makes New Swift lose weight by 40kg, making it a better performer in terms of mileage and other crucial aspects. Moreover, the boot space capacity now stands at a noteworthy 265L, which is greater by 58L opposed to the earlier model. The ground clearance and fuel tank witness a cut down of 7mm to 163mm and 5L to 37L, respectively. Some of the highlighting aspects in the feature list of top end trims include a 7-inch SmartPlay infotainment system with Apple CarPlay, Google Android Auto compatibility, six-speaker system (4 speakers + 2 tweeters), flat-bottom leather wrapped steering wheel, auto climate control, projector headlamps with LED DRLs, dual-tone alloy wheels, voice recognition system, keyless entry system with push-button engine start/stop, Bluetooth audio streaming, in-built navigation, rear parking sensors, reverse camera and others. On the safety piece, dual airbags and ABS with EBD and brake assist, front seat belts with pre-tensioners and force limiters will be offered as a standard feature across the range. Though the engines remain the same, however due to the lighter platform underside there are obvious chances of increase in the fuel efficiency. The old Swift recorded a claimed mileage of 20.4kmpl for petrol and 25.2kmpl for diesel engine. The mileage of 2018 Swift is claimed as 22 kmpl and 28.4 kmpl for petrol and diesel motors, respectively. ← Datsun Cross Unveiled In Indonesia – Exterior, Interior, Features, Video, Engine and more!